This week witnessed the serendipitous alignment of three events. First, my shady real estate company decided that the building immediately adjacent to my deck has been sufficiently torn down to allow the dust to finally settle for a couple of days. Second, temperatures reached a record high, allowing me to finally utilize the dusty deck. And third, I had ground beef on the mind. Ok, ok. So the third is not quite an event per se—more like a constant state—but this week, I had a very particular form of ground beef on the mind. It comes large, juicy, and grilled, topped with creamy, salty Roquefort cheese, sandwiched in a bun that straddles the line between Wonderbread and Briôche (admittedly quite a thick line), and is served with a mound of crisp rosemary-garlic shoestrings and a two and a half hour wait. On paper, April Bloomfield's burger at The Spotted Pig is the near antithesis of my ideal burger. I like them griddled. Hers is grilled. I like mine small. Hers is a whopping half pound. I like my buns soft, squishy, and mass-produced. She bakes her own. I like American cheese. She goes for stinky Roquefort. Yet, as anyone who remembers my Burger Bender knows (way back when I was still just plain Kenji Alt), it's a burger that snuck up on me from out of nowhere, took me by surprise, and practically forced me to fall in love with it (kind of like my wife, except most of the time, she's not covered in blue cheese). Despite the fantastic atmosphere at the Pig (especially at the little window seats by the bar), there have been countless times that I wished I could get my hands on their burger without having to trek to the West Village and prepare myself for an entire evening of waiting. So this week, I decided to put the Pig's burger through the Burger Lab treatment, deconstructing it and analyzing it so that we can all enjoy its grandeur in our own backyards. The original bun is a four-inch wide, 2-inch tall round of what at first appears to be glossy brioche, and is described as such by numerous sources. But careful tasting and analysis reveals a slightly different verdict. This bread is entirely too soft and giving to be brioche, lacks its characteristic sweetness, and much of its richness. I find brioche to be too cottony for burgers. This bun, however, is spot on. To crack the formula, I made several batches of brioche buns, before finally arriving at a version in which I drastically reduced the amount of butter and milk (instead replacing it with water), and used softer all-purpose flour in lieu of stronger, high-protein bread flour. To achieve the ultra-gloss finish, I tried various iterations of egg washes—whites alone, yolks alone, whole eggs. None of them worked until I struck on treating the buns much like I'd treat a wall. I applied an initial coating of wash just before it went in the oven, then followed it up with a second coat seven minutes later, after the first coat had fully dried. The result? A perfectly smooth, lacquered and shiny crust. April Bloomfield herself has supposedly provided a recipe for the Spotted Pig's burgers in the Telegraph, calling for two parts ground brisket, and one part each rump (aka sirloin) and chuck. But something was awry. This blend produced patties that were sorely lacking in richness, while the burgers at the real Pig are fatty umami-bombs. Perhaps April wasn't coming completely clean? Some more hard-core snooping was in order. My normal protocol is to overwhelm the waitstaff with my natural charm—one of the few things with which I have been bountifully endowed. But on this occasion, I knew for a fact that the recipe for the burger mix—which comes from master burger blender Pat LaFrieda—is locked behind tightly sealed lips. In order to replicate the mix at home, I'd have to get my hands on some of the raw burger meat. Without it, it'd be nearly impossible to disentangle and analyze the flavors of the pure meat from the deep, charred, smokey flavors provided by the grill. But how could I possibly get a raw Spotted Pig burger home? Me: "Could I order one more burger, this time to go?" Cute bartender: "Sure—how would you like that cooked? Me: "I'd like it as rare as possible please." CB: "Like black and blue?" Me: "Yeah, except more so. 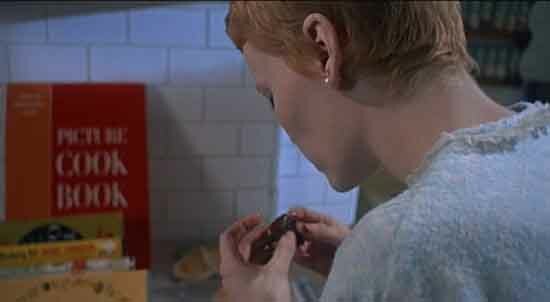 I'm bringing it home to my wife, who happens to be Mia Farrow from Rosemary's Baby." CB: "Gotcha. Nice classic movie reference." Me: "Thanks. I try to work at least one into every post." One subway ride later, I was safely at home with one nearly raw burger on my board, happily discovering that peeling a burger is very much like peeling a grapefruit, only mushier. I soon had a core sample in hand for investigation. With fresh, raw burger meat to work with, I fried up a few batches and tasted. Like with the Spotted Pig? We must've come up with 25 different blends before she chose one. Twenty-five! First she wants more short rib, then less, then more. A mix of equal parts short rib, sirloin, and brisket (a mix not vastly dissimilar to our Blue Label burger blend) was almost spot on—particularly when I included a good portion of the fat cap on each short rib. The last bit of the puzzle fell into place, this time coming from a source via The Food Lab's Facebook page. Apparently, in a moment of drunken bliss, a Spotted Pig cook (who shall remain unnamed) accidentally revealed to my source the burger mix's secret ingredient: beef suet. No wonder the darn things are so tasty—there's straight-up beef fat ground in with them! The extra fat pumped my burgers up to close to the 25 percent fat range—a bit more than even the fattiest cuts available at a regular supermarket. The final ingredient is cheese, which must be Roquefort. No other blue cheese has quite the same soft, spreadable texture, essential for melting over the top of the burger. Being a sheep's milk cheese, it also has a distinct tang that plays nicely off the richness of the beef. To shape the buns, I made sure to make raw patties that overhang the buns by a good half inch to account for shrinkage. I shaped them with a slight well in the center to compensate for the edges shrinking more than the middle during cooking, delivering a perfectly flat patty post-cooking. Mercilessly seasoning the beef with salt and pepper was also absolutely essential to deliver full-flavor. I used at least a full teaspoon of kosher salt on the exterior of each patty. Yeah, it seems like a lot, but trust me. It's worth it. A one inch-thick half pound patty can be a little challenging to cook on the grill. It's a balance between getting great grill marks (a key feature on the Pig's burger), and hitting just the right temperature in the center. By building a fire under just one side of the grill and preheating the grill grates for a full five minutes after the coals were fully ignited, I was able to get great grill marks in just a minute or two on each side of the patty before transferring them to the cooler side of the grill and covering in order to finish cooking through at a more gentle pace. They hit that perfect medium-rare (as checked by a thermometer, of course) in just a few minutes. After topping the patties with Roquefort while they rested, putting the signature grill marks on the bun, and assembling, my work was complete. One Spotted Pig Burger, minus the wait and the bill. True, no cute bartenders or Old Speckled Hens, but my wife and a tall boy of PBR will do just fine, thank you.